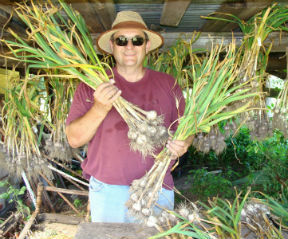 Caretaker is a big, robust, strong, full flavored, hardy, hardneck garlic. If you grow Porcelains or other later harvesting, longer storing garlics, you should also be growing this early harvesting hardneck and saving the longer storing ones for later. Grows well in most areas of the USA. Taste test - Wow! I bit a chunk out of a clove of Caretaker and sat back to see what life would be like for the next minute and at first it was very light and crisp and rather shallot-like similar to Ukraine in taste but no apparent hotness until it came on with astonising suddeness and all I could do was to sit there with my mouth agape as if in a trance until the hotness passed about 30 seconds later leaving me with a warm rich shallot-like aftertaste that took a few minutes to dissipate. I want more of this garlic!